A group of singers has staged performances on nine fells which were gifted to the nation in commemoration of those who lost their lives during the conflict. More than sixty members of the impromptu choir made 3,000m of ascent, walking 25 miles during the acts of remembrance, which began in May and ended at the weekend. 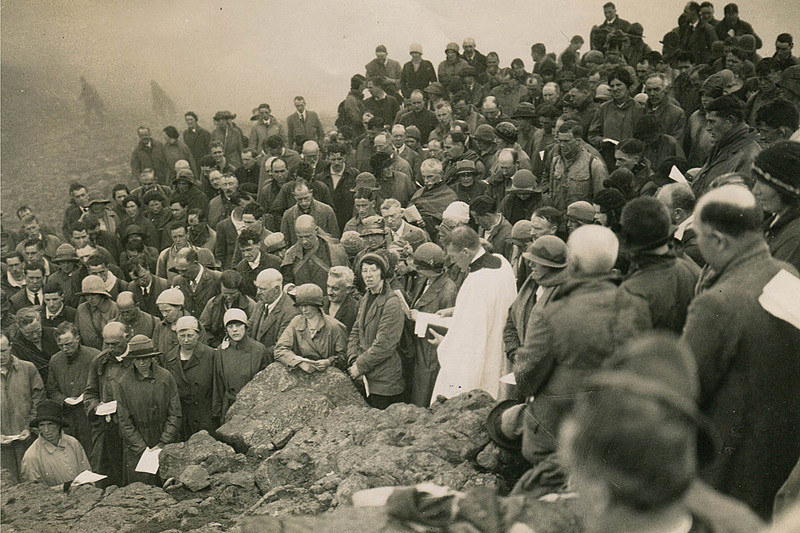 The singers performed a specially commissioned song on each of the nine peaks, sung over three weekends, marking the ‘Great Gift’, a legacy of 14 mountains gifted to the National Trust by the Fell and Rock Climbing Club and private landowners after the 1914-18 war. The 12 peaks gifted to the National Trust by the FRCC in 1923 were Lingmell, Broad Crag, Great End, Seathwaite Fell, Allen Crags, Glaramara, Kirk Fell, Great Gable, Green Gable, Base Brown, Brandreth and Grey Knotts. Scafell Pike was given to the trust in 1919 by Lord Leconfield, and Castle Crag was given by Dr W H Hamer and his family in memory of his relative, 2nd Lieutenant John Hamer, and the men of Borrowdale. Jessie Binns, the National Trust’s visitor experience manager in the Lake District, who recruited the choir to mark 100 years since the end of the First World War, said: “These mountains were given as memorials for everyone to enjoy, and the National Trust is extremely proud to have cared for them ever since. “If everything around you is feeling uncertain and unstable, a connection with the natural world can feel grounding. Cumbrian songwriter, musician and teacher, Dr Dave Camlin, created a new suite of songs for the occasion, which included a new arrangement for the words from the dedication speech. In May the choir performed on Great Gable, Green Gable, and Grey Knotts. The following month they sang on Lingmell, Scafell Pike and Broad Crag, and this month they performed on Thorneythwaite Fell, Glaramara and Allen Crags. The singers also ascended Brandreth. A member of the choir said: “To be able to sing in a choir surrounded by such stunning scenery was a real privilege. It felt incredibly powerful as the sound was carried far across the land by the wind. During the performance at Great Gable the choir was filmed by a 360-degree video camera. The resulting film has been used as part of an experiment at Keswick Museum in collaboration with the University of York, to compare real-life experience of the performances with a virtual version. Participants of the experiment wore a headset through which they can experience the panoramic views and singalong as though part of the choir. Afterwards, participants were asked a series of questions about their mood, as were members of the outdoor choir. Their answers will test whether the virtual world can produce the same health and wellbeing benefits as activities in the real world. The choir’s performances are part of a wider programme of remembrance events organised by the National Trust in the Lake District this year. In May, a team of the conservation charity’s rangers and volunteers from the Fell and Rock Climbing Club spent a combined 200 days repairing footpaths and rebuilding the summit cairn on top of Scafell Pike. 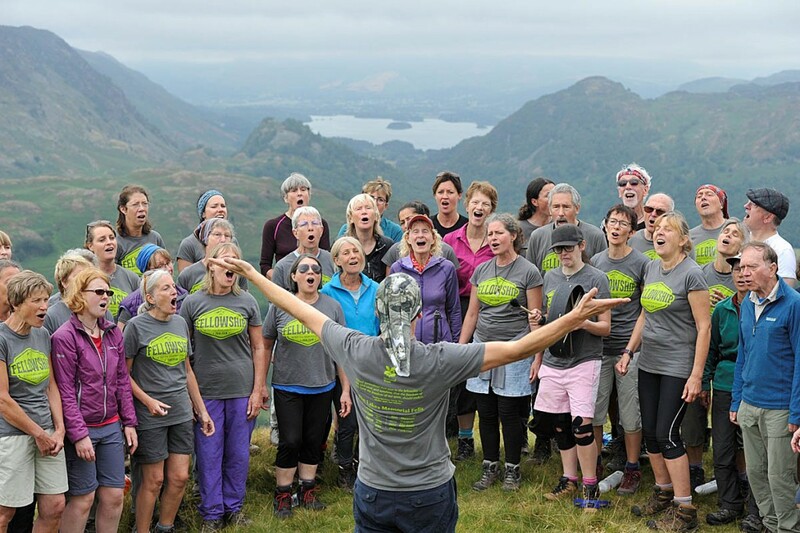 At the Lakes Alive Festival in September there will be performances from the Fellowship choir and singing workshops and at November’s Kendal Mountain Festival films will be shown, documenting the Great Gift’s lasting legacy. On 13 October the National Trust is inviting people to join a singing picnic at Peace How, a small hill near Derwent Water in Borrowdale. It was given to the National Trust in 1917, so that servicemen from the trenches could experience peace and tranquillity. Tickets are free but must be booked in advance from the National Trust website. October is also a last chance to visit the Where Poppies Blow exhibition at Wordsworth House, which explores how men endured the horrors of war through the wonders of nature. I went online,as advised in MAGAZINE, to find details of the THE GREAT GIFT event on 13th Oct. Following major neck surgery last year and subsequent unsteadiness, I need to know what distances and climbs are anticipated on this worthwhile event in which I should like to participate. However, unless I can't read the literature nor understand the info detailed online, I can find no references to what I regard as this vital information. I don't wish to drive 100+miles to find that I can't do it; then drive all the way back annoyed and disappointed because no attention has been paid to this matter.